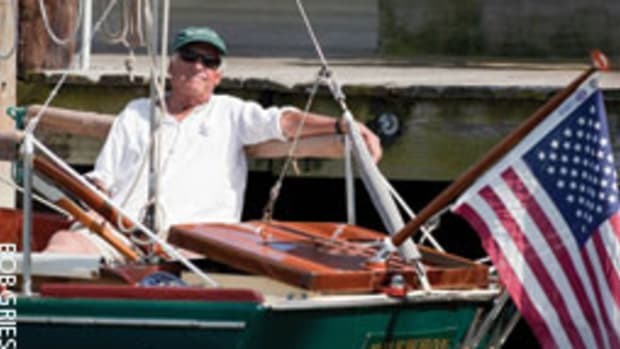 The first Scarano-built schooner named Woodwind arrived in Annapolis as a dude daysailer almost 20 years ago, followed by an identical twin sister (Woodwind II) in 1997. These graceful epoxy-covered wooden vessels with modern underbodies from the Scarano yard in Albany, N.Y., have since become fixtures on the Chesapeake. Sister schooners also work touristy ports from Key West to New England. The Schooner Woodwind Co. is a solid family business run by the Kaye family: Ken and Ellen, and their daughter Jennifer. 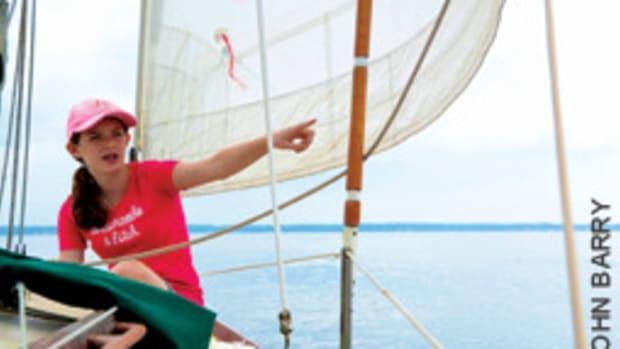 The schooners sail seven days a week from early April through October, with breaks for the annual sailboat show and the Great Chesapeake Bay Schooner Race, where Woodwind is a perennial top-three finisher. “In our first season in 1993, which didn’t get under way until July, you might say we kept our heads above water, and the operation stayed afloat,” says Ken, 64. It has been going gangbusters ever since. 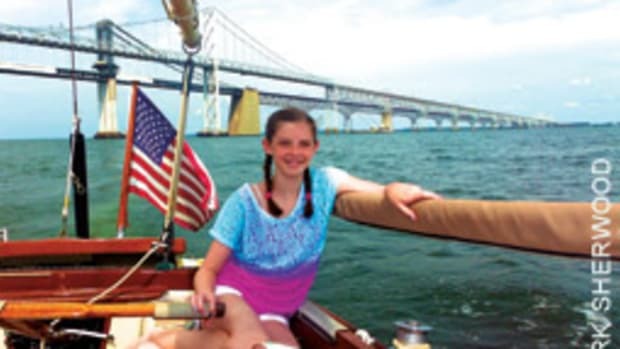 The Kayes pride themselves on offering real outings under sail on Chesapeake Bay and stress the sailing aspect, unlike some motorsailing excursions that raise a sail or two mostly for show. Sails are raised as the schooners exit the harbor and as soon as they can turn into the wind. The Woodwinds are notably swift and stiff and usually carry four sails and as many as 48 passengers, so they can get a little crowded, not unlike the so-called “cattlemarans” of the tropics. The captains turn the wheel over from time to time to those interested in steering. Their playground is a 20-square-mile area bordered by the Chesapeake Bay Bridge to the north, historic Thomas Point Lighthouse to the south, Kent Island to the east and the Severn River to the west. On a typical two-hour sail they might cover 15 or 20 miles. It’s a busy stretch of water, with racers and regattas and anchored cargo carriers awaiting dockage in the Port of Baltimore. 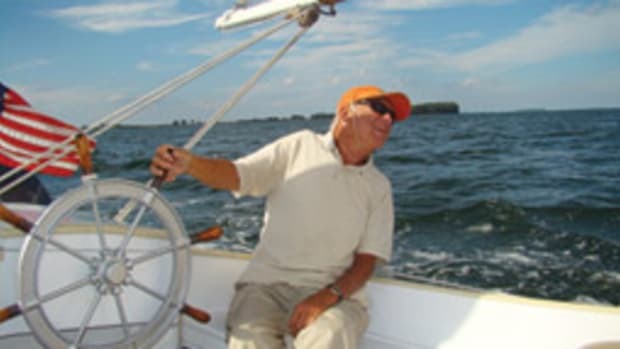 Through the years, I have often encountered the Woodwinds while on my Sailmaster 22 as they roar by with dozens of passengers on deck. Being on a 62-foot sailing vessel with 50 people might be horrifying to this solo sailor, but it gets the general public out into the middle of the Bay and gives novices a taste of the salty life. The adult weekday fare is $36. They also serve snacks, beer and wine. When Capt. Jen is closing in at close proximity to me, I can hear her prompting her boatload and counting off: “One, two, three — hey, Jack!” It’s quite an experience to hear 50 voices shouting your name, and I shout right back, “Hey, Woodwind!” They always leave me in the dust. 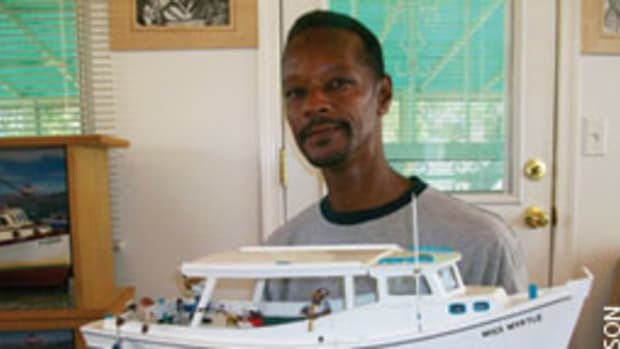 I sometimes wonder what Jennifer tells them about this solitary senior sailing alone on his classic fiberglass sloop. Get out the digital cameras. 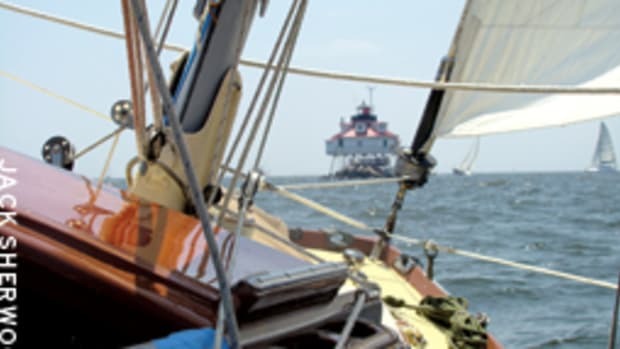 The highlight of the season comes in mid-October with the Great Chesapeake Bay Schooner Race from Annapolis to Portsmouth, Va. Passage aboard Woodwind for this annual colorful event is always sold out, as is the return cruise to Annapolis. It’s a joy for the Kayes and crew to sail beyond Thomas Point Lighthouse with 130 miles of water ahead of them. The big surprise was the awarding of the Black Dog Trophy to the Woodwind crew. It is given to those who have demonstrated pride and commitment to the schooner race, which was founded by “tugatine” Capt. Lane Briggs. He had a black dog named Black Dog. Woodwind has sailed in every race since 1993. Woodwind, however, is not the only headboat schooner sailing out of Annapolis. Liberte is a three-masted steel schooner that carries 49 passengers and operates from the Chart House Restaurant dock in the Eastport section of town. Sailed by Chris and Jane Tietje, Liberte is not as swift as Woodwind but is a bit roomier, with an 18.6-foot beam and an LOD of 65 feet (LOA 74 feet). 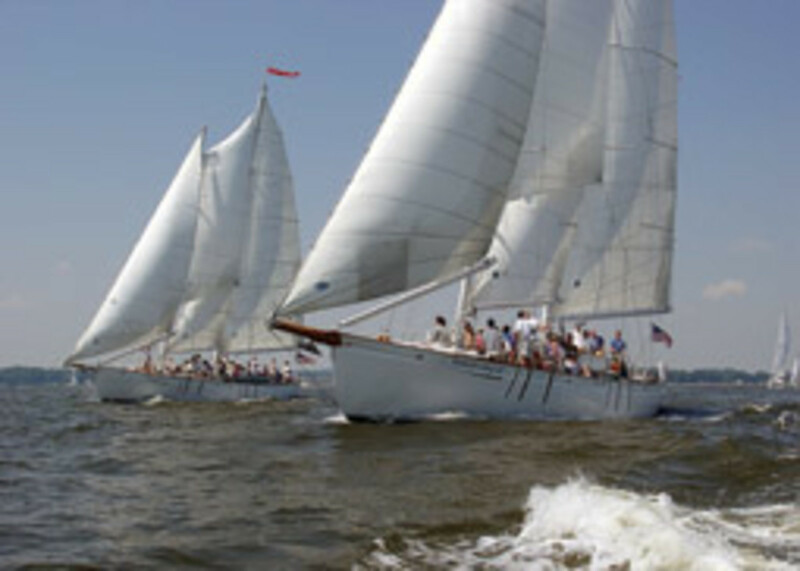 She daysails out of Falmouth, Mass., in July and August, returning to Annapolis for September and October. For information, go to www.theliberte.com. 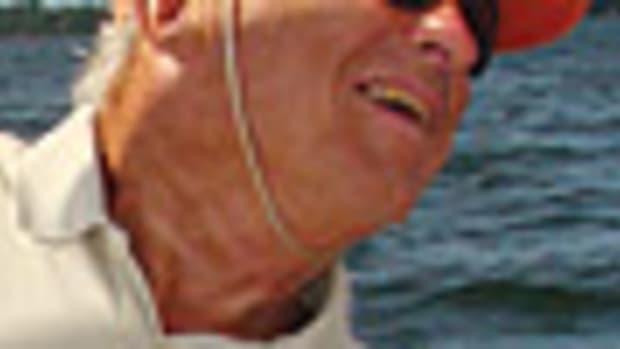 Information about Woodwind is at www.schoonerwoodwind.com.